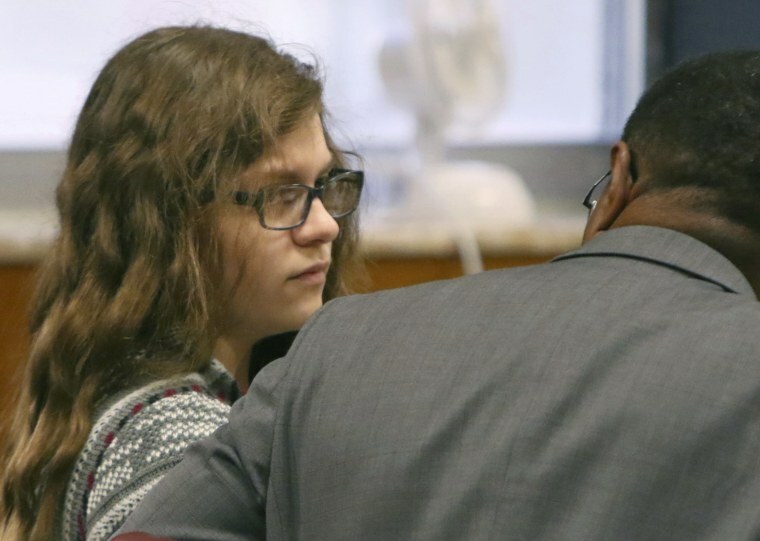 WAUKESHA, Wis. — A Wisconsin girl who admitted to participating in the stabbing of a classmate to please horror character Slender Man will avoid prison after a jury determined Friday that she was mentally ill at the time of the attack. Both Weier and Geyser told detectives they felt they had to kill Leutner to become Slender Man's "proxies," or servants, and protect their families from the demon's wrath. The Leutner family said in a statement Friday that they were disappointed in the outcome. "The decision allows the assailant to petition the court every six months and request release into the community," the Leutners said. "Their decision also forces our family to relive this horrific crime every six months wondering if they will be released." "The potential release of an assailant that methodically planned and executed an attack in which our little girl was stabbed 19 times puts the community and our family at risk. It is deeply disappointing," they added. Weier, now 15, pleaded guilty to attempted second-degree intentional homicide in a deal with prosecutors in August. But she claims she was mentally ill during the attack and not responsible for her actions, in a bid to be sent to a mental institution rather than prison. A plea agreement before trial called for her to spend at least three years in a mental hospital if judged mentally ill, and 10 years in prison if not. The jury's verdict came after some 11 hours of deliberations, and about an hour after it had appeared to reach a verdict in Weier's favor only to see it rejected by Judge Michael Bohren. Though that first verdict wasn't read in court, defense attorney Maura McMahon said 10 of 12 jurors — the minimum required by law — voted Weier was mentally ill. On a second question that jurors had to decide — whether she was criminally responsible for her actions — 10 jurors also voted she was not. But it wasn't the same 10 on both questions, according to McMahon. Bohren ordered the jury to resume deliberations. In closing arguments, McMahon told the jury that Weier was lonely, depressed and descended into "madness" that warranted a mental hospital rather than prison. McMahon said Weier's unhappiness stemmed from her divorce, and she latched onto Geyser. "This sounds crazy, because it is," McMahon said. "This was a real being to this child and she needed to protect those around her. At 12 years old, she had no way to protect herself from (Slender Man) except for Morgan's advice and they swirled down into madness together." He also pointed out that Weier told a detective she wasn't frightened of Slender Man until after the attack, when Geyser told her she had made a deal with the monster that he would spare their families if they killed Leutner. "It comes down to did she have to or did she want to?" Szczupakiewicz said. "It wasn't kill or be killed. It was a choice and she needs to be held criminally responsible." Wisconsin law requires only 10 of 12 jurors to render a verdict on whether a criminal defendant wasn't responsible for her actions due to a mental condition.